This is a really good example of a customer transforming one of my standard designs into her own. The initial enquiry from this couple was regarding this Euro band ring. I was given a budget and diamond quality and asked to quote on what I could provide. I was also asked to change the main diamond from square to round. The ring was to be made in 950 Platinum. I changed the design to reflect the diamond we were going to use. An important part of this process is of course scaling everything to the intended finger size in order to give a true reflection of the shape of the ring. During some browsing on my website the customer liked the diamond setting in the band of this ring and wanted to apply it to hers. She liked the shared prong style of setting and full width of the band diamonds. I am never quite sure how changes like this will turn out so I try to design with an open mind. This is how the changes turned out and the customer liked it. I was next asked to remove the Euro style band to see if she preferred it better with a conventional one, which in the end she did. The couple so far had designed the ring together. It was decided to make the draft ring in 18ct Palladium white gold and use it for the surprise (to a degree) proposal. The plan was to wear the draft ring over the summer to see how the sizing went and adjust it if and as required. Once we were 100% certain of the finger size the ring would be remade in 950 Platinum. 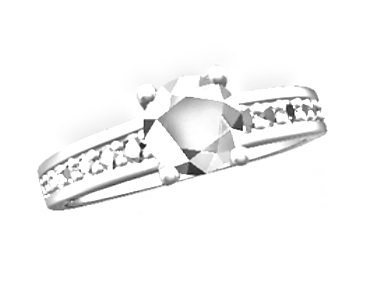 We did not want to resize a brand new Platinum ring. Whilst not a delivery of the finished ring it was the one used for the proposal and that will be worn for the near future. I received the good news via text message this morning as I type this that she said yes and loves the ring.